Dalston Junction "step free" access? TfL must be joking! TfL make a great play that their East London Line stations provide "step free" access - meaning level access so that disabled people can use the trains too. With £63mn spent on the Dalston Junction Transport Interchange you'd think they'd have got it right. 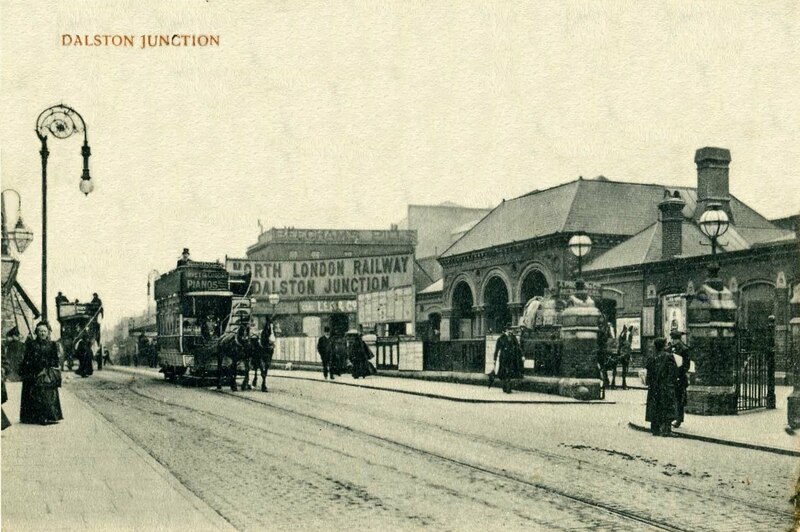 Here's an account of a bus trip to the Dalston Junction Transport Interchange by local resident John Thornton. "The media, in particular The Telegraph, have been quite incorrect when stating that "the stop is only being used by one bus route, the 488 from Bow to Dalston Junction". As I discovered to my horror, The Slab does not serve the 488 "from Bow to Dalston Junction" at all! It does serve the 488 from Dalston Junction to Clapton and Bow, but NOT in the other direction. 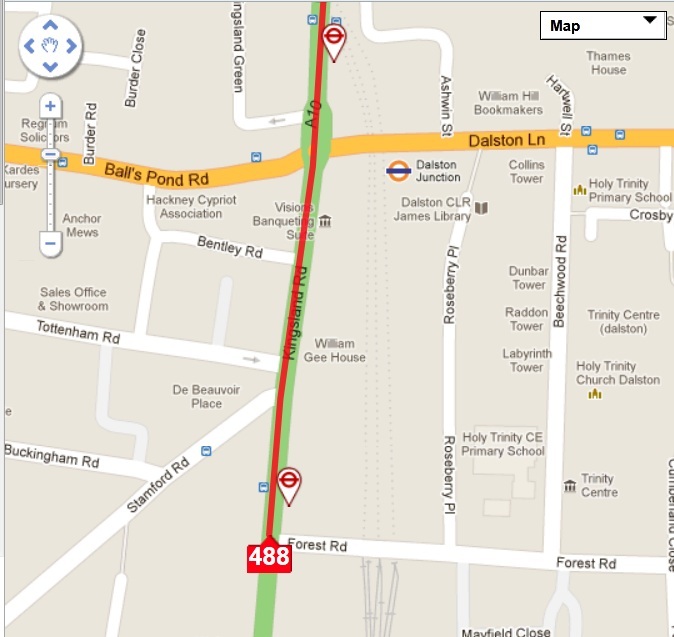 The 488 from Bow to Dalston Junction terminates at the bus stop "D" in Kingsland Road, near Forest Road (see TfL 488 bus map). Passengers must alight there and then walk back along Kingsland Road, and up the steep ramp, to get to the Overground station. Anyone mobility impaired such as myself, a wheelchair user, or someone with a heavy suitcase, etc, (or a non-disabled person in icy weather) will have great difficulty climbing this steep ramp so access to the station (for me) has to be via the entrance in Dalston Lane (which is quite some distance to trek from bus stop "D" ). The ramp where the 488 buses to Bow emerge from The Slab and pick up passengers. The 'step free access' to the rear entrance of Dalston Junction station is to the left at the top of the ramp. On one occasion I persuaded a 488 bus driver to drop me off at the drivers' Rest Stop on the actual Slab. However, the idiots who designed and built the bus station didn't bother installing a dropped kerb there and, as I approached the station entrance from the Rest Stop, I discovered the footway gets progressively narrower and narrower until ... it gets too narrow for the wheelchair at all and I just tipped over and fell off the high kerb into the road! Bus stops at transport interchanges should contain facilities similar to the ones we enjoyed at the old Dalston Junction bus stops (in Dalston Lane) in the mid-1980s, namely; distinctly separate but adjacent stops dedicated to different routes e.g. West-bound [30, 38, 56, 277] or South-bound , shelters, seating, timetables, wide pavements, public telephone boxes, litter bins, access to alternative transport such as taxi ranks nearby. Oh, they should contain that recent addition, which didn't exist in the 1980s, the Countdown signs - although there were always plenty of friendly bus inspectors around to tell you when the next bus was due! " An Examination in Public by a government appointed Inspector was held at the Town Hall on 3.7.12 to consider whether the Council's Dalston Area Action Plan (DAAP) is lawful and sound. He is expected to publish his report in August. Since the Council first published the DAAP the government has introduced the National Planning Policy Framework (NPPF) which includes the "presumption in favour of sustainable development". Where a planning application accords with an up to date local plan, like the DAAP, then the "application should be approved unless there material considerations indicating otherwise". 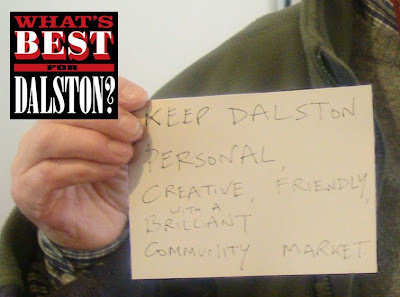 The content of the DAAP is therefore critical to Dalston's future environment. At the time when the Council was consulting the public in May 2009 OPEN organised an exhibition and its own public consultation about the DAAP . Taking on board what hundreds of people told us we made detailed representations to the Council which included the need for improved public realm, including more green open space, the need to avoid damaging the settings of attractive buildings in the area and the need to nurture local independent buinesses. You can read OPEN's, and other, representations to the Council here. After the public consultation closed the Council made further changes to the DAAP which it adopted in November 2010. It is that document which is being considered by the Inspector. One of the major changes the Council made to the DAAP, after public consultation closed, relates to the Eastern Curve - the former railway line that is currently the Eastern Curve Garden. 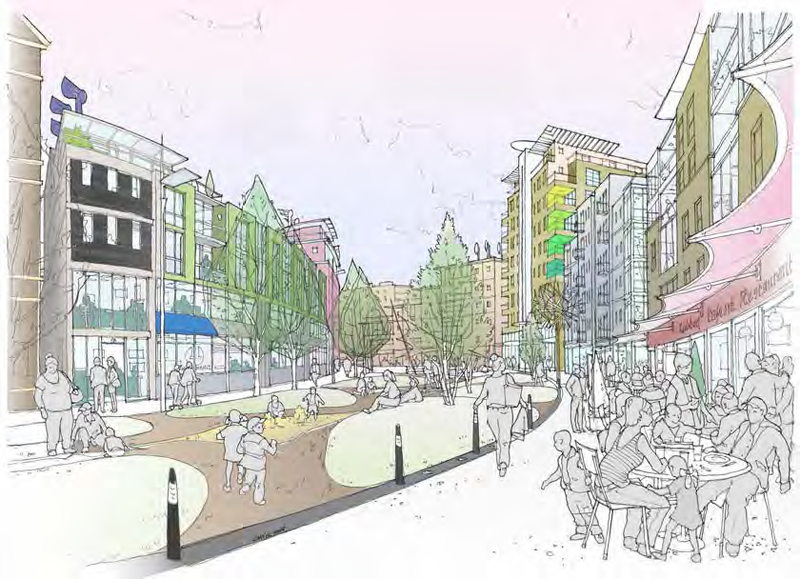 That site was originally promised to become Dalston Park but the DAAP was changed to identify it as a proposed "shopping circuit" linking Dalston Square to Dalston Shopping Centre. The Shopping Centre is proposed for redvelopment with tall buildings. The aim, the Council explained, is to create conditions to attract national chain stores to Dalston so residents don't need to go shopping elsewhere ("to curb spend leakage"). How Dalston will be regenerated by local residents putting money into the off-shore bank accounts of these chain stores remains unclear. Artist impression of the eastern Curve "shopping circuit"
You can read here the written representations made on behalf of OPEN to the Inspector in advance of the hearing. At the inquiry itself the Council produced an independent light consultant's report, said by the Council to have previously been "witheld". 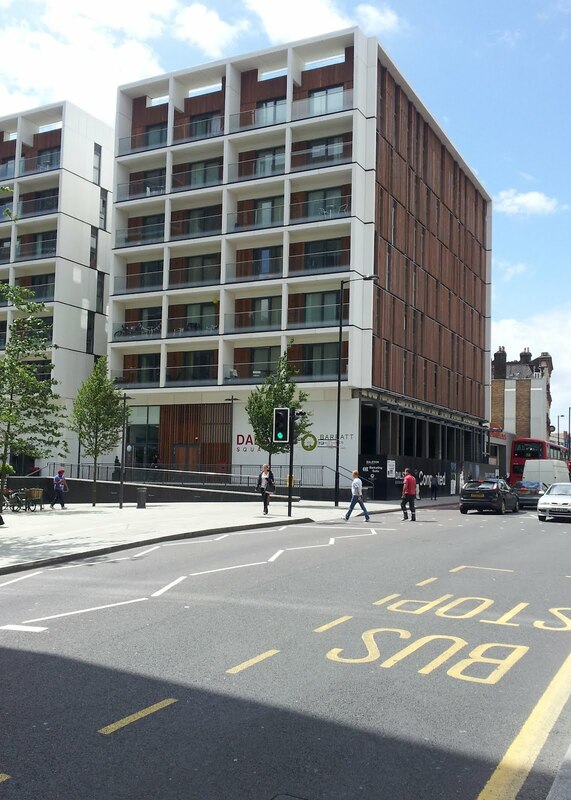 The report illustrates the overshadowing effect of the DAAP proposals for an 8-storey building along the Eastern Curve, 15 storey tower(s) as part of a redeveloped shopping centre and a 15 storey tower at Peacocks site next to Dalston Kingsland station. The report illustrates extensive overshadowing across the Eastern Curve, Ridley Road market and the Dalston Kingsland area.You can read OPEN's seperate representations regarding that report here. 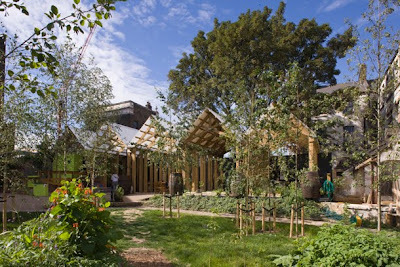 Dalston is one of the densest Wards in one of the densest Boroughs in London and has a severe deficit in open green space and children's play areas.The DAAP fails to outline a 'masterplan' for creating better public and green spaces locally which could be achieved by utilising parts of the many undeveloped demolished sites in Dalston owned by TfL and the Council. OPEN was represented at the Inspectors inquiry by Bill Parry-Davies and argued that the DAAP proposals conflict with the NPPF guidance that local plans should contribute to "protecting and enhancing our natural, built and historic environment", "achieving gains in bio-diversity" and "supporting strong, vibrant and healthy communities". OPEN has been informed by Transport for London (TfL) that, despite its earlier claims, no particular use will be made of Dalston's £63m Transport Interchange during the 2012 Olympic Games. The front page article in this week's Hackney Gazette, and in The Telegraph, explain something of this convoluted mystery . The Slab scheme involved demolition of Dalston's historic buildings and the Secretary of State wrote to OPEN's solicitor, Bill Parry-Davies, on 18.7.06 to explain her refusal to halt the demolitions by stating that “the proposed interchange will be a major transport interchange between the East London line northern extension, the North London line and London buses, an essential part of the transport improvements required for the London Olympics 2012”. The Secretary of State explanation didn't make sense. 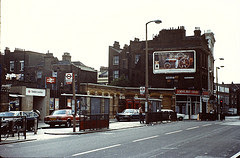 The East London line at Dalston Junction does not interchange with the North London line which is at Dalston Kingsland. 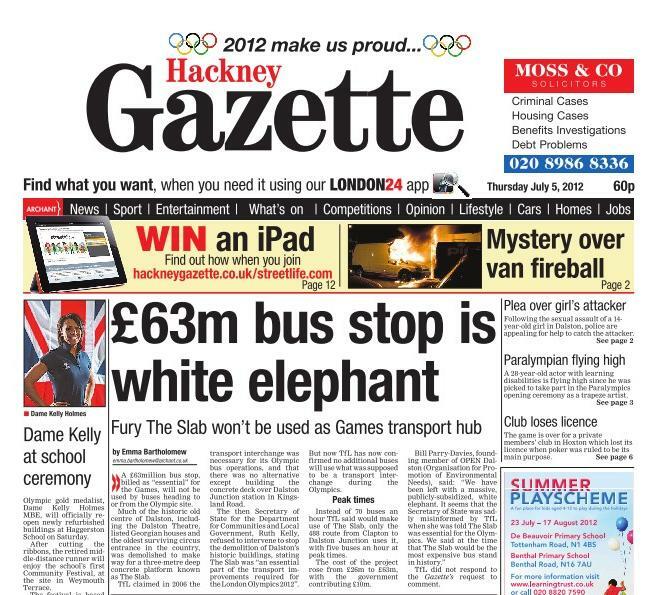 Neither do the buses from Dalston Junction go to the Olympic site. Now, following a series of Environmental Information requests made on behalf of OPEN, we learn from TfL that no increased use will be made of Dalston's Olympic bus stop at all during the 2012 Olympic Games. It seems that the Secretary of State was sadly misinformed by TfL when she was told The Slab was essential for the 2012 Olympics. The Slab under construction over the Dalston Junction railway cutting. It was built to accommodate the bus/rail Transport Interchange on top of the rail station. The Dalston Square towerblocks, with 90% of the flats for private sale, and shops (still empty) were built to help pay of the scheme. OPEN objected to the authorities at the time saying that The Slab would be the most expensive bus stand in history. There was widespread community opposition to the expense and vandalism of the scheme. The demolitions included the 1886 Dalston Theatre, Georgian houses and the oldest circus entrance in the country. All were demolished when the Council granted itself, and TfL, planning permission to build The Slab scheme ( known as Dalston Square) on the Council's and TfL's neighbouring sites. The Council didn't want to keep the old circus building but now we've been left with a massive, publicly subsidized, white elephant. 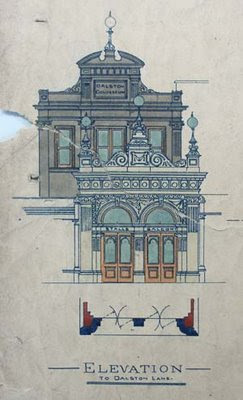 The architect's drawing of Dalston's 1886 circus entrance, with the 1898 variety theatre entrance built in front of it, which was at 12 Dalston Lane. These buildings became home to the legendary Four Aces Club and later The Labyrinth. OPEN's independent engineer said they could be repaired, as did the Council's own Planning Department survey. But the Council's officers reported to its Planning Committee was that they were beyond repair although their own engineer didn't even inspect these entrance buildings. They were demolished in 2007. The sale of the development sites to Barratt, to build retail units and tower block flats (with only 10% for affordable social housing), was insufficient to pay for TfLs estimated costs of building The Slab. So Hackney gave up its site on a peppercorn lease to help cross-subsidise the scheme. 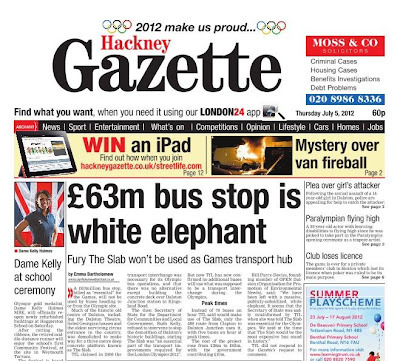 The sale was so under market value that Hackney had to get the Secretary of State to approve the deal. There are 150 buses an hour passing through Dalston at peak times but TfL recently revealed that none of these would be using the bus station after all - because having to drive onto The Slab and off again would just delay passengers. These delays were pointed out to TfL by its own consultants, and OPEN, before The Slab was built. 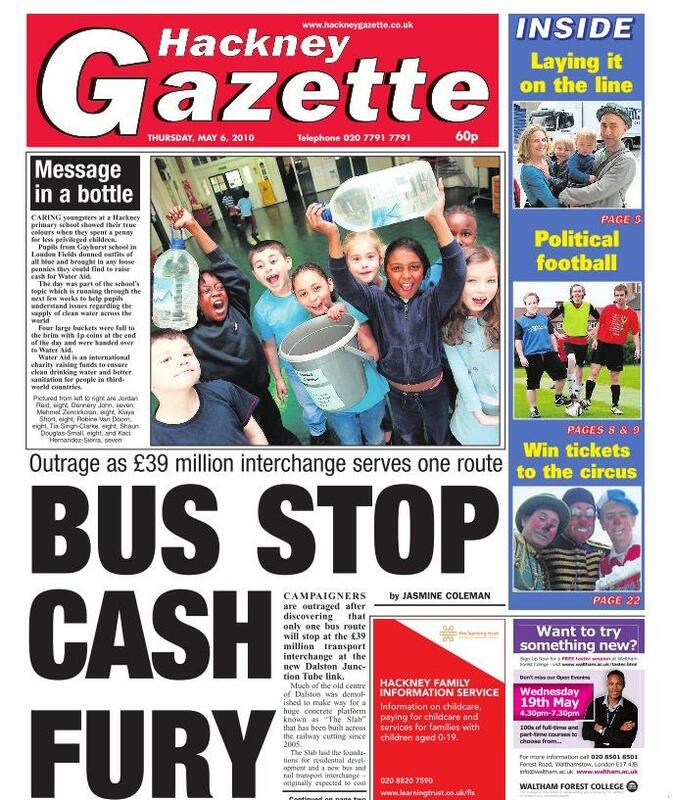 But TfL went ahead and spent the £63m regardless. Of up to 70 buses an hour capacity that The Slab was built to service there are now only 5 buses an hour at peak times, and only since the 488 extension from Clapton to Dalston was introduced last year . 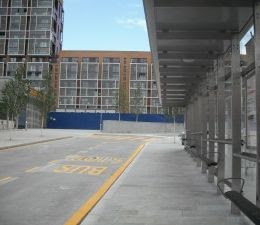 Dalston's empty Olympic Bus Stop on The Slab. A non-place which is now to be used by only the 488 bus route running 5 buses an hour during peak times and not up to 70 buses an hour capacity that it was designed for. 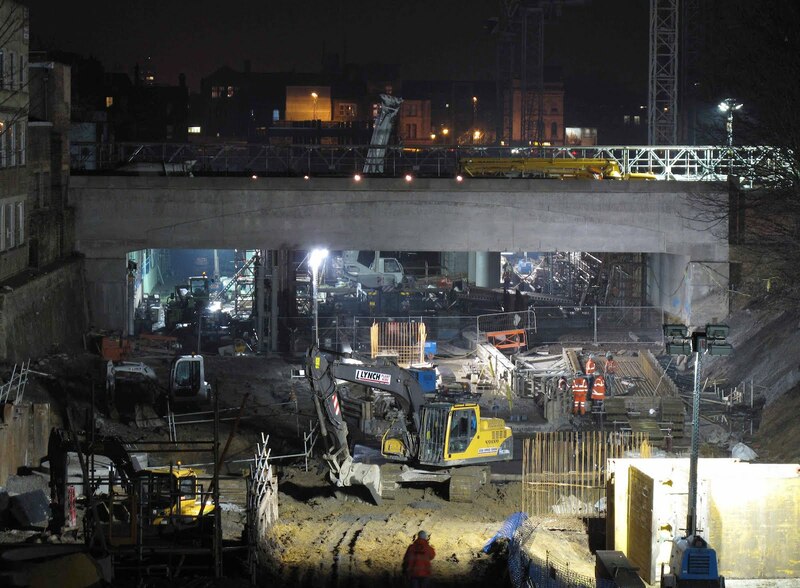 The cost of The Slab over Dalston Junction rose from an intial estimate of £18million to £26mn to £39mn and, finally, to an estimated £63mn during the course of the project. There was controversy when the escalating cost became public knowledge. The Mayor of London promised to investigate. However Boris' report didn't explain the massive increase in the Slab's cost at all and even said that only one building was demolished to make way for the scheme. The report was a deluge of drivel. Still, even if public money has gone down the drain, TfL's contractors, Balfour Beatty and Carillion, have had a good Olympics. In addition to building The Slab for TfL's Dalston Olympic Bus Stop they secured other valuable construction work in Hackney. Balfour Beatty recently secured a £73million 5-year contract for the Council housing Decent Homes programme. Carrillon built the Media Centre on the 2012 Olympic site ( formerly public Lammas land). But, although Hackney still hopes the Media Centre will provide a lasting legacy for the borough, its demolition is now being considered as an option. These two companies 2012 profits will dwarf the fines of over £5million each which they had to pay to settle allegations that entities within their companies had been involved in irregular practices in the West Midlands. The payments followed investigations by the government's Office of Fair Trading (OFT) which discovered widespread price fixing and corrupt practices involving numerous construction companies when they tendered for public works projects.